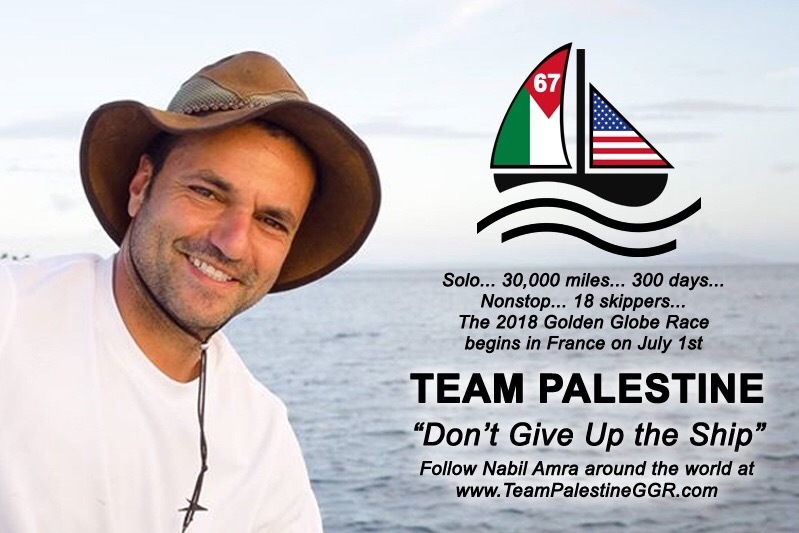 Fundraiser by Nabil Amra : Golden Globe Race - Team Palestine! Golden Globe Race - Team Palestine! My name is Nabil Amra, I'm a proud Palestinian, a proud American, and an avid sailor. I was born in the U.S. in 1975 and was raised like any other American kid with really no true awareness or understanding of the plight of our people in Palestine. My ambivalence was short lived. In 1987, my father moved our family back to the West Bank just in time for the Intifada. During those years, like so many other Palestinian children, my time was spent in daily protest to the injustice, humiliation, and oppression suffered under occupation. The experience profoundly transformed me and my heart never stopped thinking about it. Years later, I began to sail. Initially, it was simply another distraction. It didn’t take long before I fell in love with it and in retrospect came to realize that my love for sailing came from my love for freedom. The freedom that I was deprived of during my formative years in the West Bank and for which so many in the West Bank and Gaza yearn for, yet continue to be deprived. 2018 marks the 50th Anniversary of the Golden Globe Race Around the World. For those unfamiliar with the race, this was the first non-stop, single-handed, round-the-world yacht race. It was held only one time 1968-1969 and it is commonly considered one of the most demanding races in the world stretching over 27,000 nautical miles and requiring nearly a year of non-stop sailing. Nine sailors started the race in 1968. Only one sailor finished. The others either dropped out or died during the race. The race was never ran again. Not surprising, the race has become legendary – not only does it represent the highest level of seamanship, it requires unyielding grit, endurance, and perseverance. All traits engrained in Palestinian refugees and those living under occupation. What doesn’t kill you makes your stronger and I have faith that we will come out of this unjust occupation stronger. In 2015 it was announced that there would be a Golden Globe Race held in 2018 to mark the 50th anniversary of the original race. I was fortunate enough to be able to secure one of 30 coveted positions for the race. Most importantly, I will be sailing under the Palestinian flag as a showing of solidarity with the ongoing suffering of Palestinians and their unyielding desire for freedom. As far as I can tell, the Palestinian flag has never been flown in a race of this import and I truly feel fortunate for the opportunity to fly our flag around the world. While Palestinians have a long and storied tradition of sailing, these days they are not even allowed to access their own coastal waters. As many of you may know, recently the Isreali Air force destroyed the Palestinian Sail and Surf Federation boating fleet citing national security risks. I guess nothing spells National Security threat like teenagers training for an Olympic Sailing race! Racing under the Palestinian flag is way of supporting the 6 million people, who have had the hardest 70 years imaginable, and perhaps give them something to cheer for. For me this race is for the children of Gaza, born on the shores of the sea, but forbidden to enjoy it or even meaningfully use it. The injustice is self-evident and this race, God willing, will hopefully raise global sympathy to this heartbreaking situation. I am now gainfully employed in the U.S. as a banker and as part of this undertaking I will be quitting my job for nearly two years to train and participate in the race. I used my savings to purchase a sail boat in England where the race is to begin. I am seeking financial support to rig the boat with the necessary equipment so that we will have a fighting chance to succeed. For that I respectfully and humbly ask for your support. Please watch the video and help make this a reality by donating to this effort. Anything will help. So there you have it, I hate to even look at this, I feel kinda sick!! Also, don’t hesitate to contact me contact me if you have any questions. We are eager to help Nabil realize his dream of sailing around the world. It’s just a set back, you can overcome it. Go Nabil, Go! !